Uige (pronounced: "Weej"), one of the eighteen Provinces of Angola, is located in the northwestern part of the country. Its capital city is of the same name. Municipalities within the province include Alto Cauale, Ambuila, Bembe, Buengas, Bungu, Damba, Macocola, Milunga, Mucaba, Negage, Puri, Quimbele, Quitexe, Sanza Pombo, Songo, Uige, and Zombo. Uige Province was one of the hardest-hit areas of Angola during the 26-year-long civil war. Large segments of the population were displaced, and the infrastructure was severely damaged. Beginning in October 2004 and continuing into 2005, Uige Province was the centre of an outbreak of Marburg hemorrhagic fever, a disease closely related to Ebola. It was caused by Marburg virus which is an African RNA virus that causes green monkey disease. Now thought to be under control, there were 374 cases with 88% deaths. According to the United Nations, it was, at the time, the worlds worst epidemic of any kind of hemorrhagic fever. During the Middle Ages, the Uige Province was the heartland of the Kongo Kingdom. The Bakongo North and South of the Kongo river were all part of this Kingdom, a centralized monarchy which for given periods of time also dominated part of the Ambundu further to the South. The kings lived in the city of Mbanza-Kongo which had a population of about 50,000 in the 16th century. They ruled with great authority in the region for several centuries. The knowledge of metallurgy among the Bakongo was renowned as they became famous as iron blacksmiths; their king was even called the “Blacksmith King”. Their reign was first strengthened by the arrival Portuguese priests who lived at the kings court and taught religion as well as literacy; the interaction with the Portuguese stronghold of Luanda was during a long period of time rather marginal. Things changed incisively when the Portuguese started in the 19th century to conquer and occupy the territory of what at present is Angola. In the beginning of the 20th century, the Kongo kingdom still existed on paper, and the court in Mbanza Kongo was maintained, but had lost any effective power. In the early part of 20th century the province was on a decline due to its inhospitable terrain and poor accessibility. The situation changed entirely when the Portuguese discovered that soil and climate were favourable to coffee production. The Uige province (then called "district") became Angola’s major centre for coffee production in the 1950s. While part of the production came from European (mostly Portuguese) owned plantations, most producers were Bakongo smallholders; in both cased, they relied on forced or "contract" labour from the Ovimbundu. Its market centre of Uige town, the district capital, prospered and was designated a city in 1956. To encourage the principle of national integration with Portugal, many towns in Angola were renamed during Portuguese colonial rule, including the provincial capital of Uige town, which was renamed Vila Marechal Carmona ("Marshal Carmona Town") after Marshal Oscar Carmona, the former President of Portugal, later simplified as Carmona. In the 1950s, the Bakongo people were among the forerunners in the independence movement. For part of them, the purpose was to restore their kingdom, but their majority came out in favour of Angola as a whole. They formed first a regional movement, Uniao das Populacoes do Norte de Angola (union of the people of Northern Angola), then baptized Uniao Nacional das Populacoes de Angola (union of Angolan peoples), and finally the National Front for the Liberation of Angola (Frente Nacional de Libertacao de Angola; FNLA), which became one of the three Angolan anti-colonial guerrilla movements fighting the Portuguese forces, during the 1960s. During the Portuguese rule, the province, and in particular the Uige City, became the haven of rebel activity (its inaccessible wilderness providing the cover for such activity) of the rebels received active support from the leader of its neighbouring country of Congo, Mobutu Sese Seko. Rebels of the Uniao Nacional para a Independencia Total de Angola (UNITA) had even occupied the province for short spells during renewed civil war in 1990s. It was only in 2002 there was peace in the region. Uniao Nacional para a Independencia Total de Angola (UNITA) lobbied in the US Congress and the White House (spending as much as US$ I million) in USA through many lobbyists who were successful in repealing the Clark Amendment which resulted in USA supplying small arms to the rebels. The Movimento Popular de Libertacao de Angola (MPLA) was also successful in securing recognition of the Bill Clinton Administration. Uige Province is located in northeastern Angola. It is bounded on the north by the Democratic Republic of Congo, on the west by the Zadi River, east by the Beu river and on the south by Beu town. The land route to enter the province is from Luanda through the province of Benga. Roads are being built over the hilly terrain to connect with Congo. 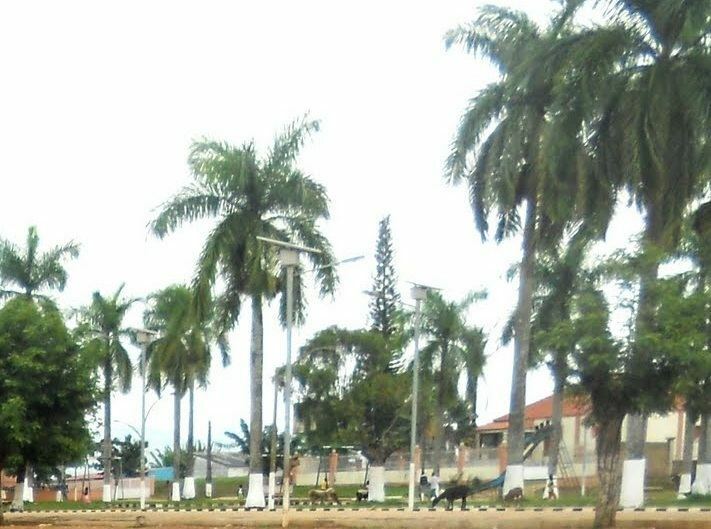 The main road in the north is the one which crosses the border at Kizenga to reach Kinshasa. A highway connects to Castilo and further on to Luanda. Another southwest highway connects with the provinces of Zaire and Malanje. The province is characterized by pastoral terrain and rich soil, with an area of 58,698 square kilometres (22,663 sq mi). It has a tropical climate with an annual average temperature reported as 24 °C (75 °F). The economy of the province is basically of traditional agricultural farming of coffee, beans, cassava, grain, peanuts, cotton, and wood. Plantation and production of coffee contributed largely to the economy of the province and also Angola during colonial times. Coffee production (in Uige, Luanda, Cuanza Norte and Cuanza Sul provinces of Angola) was started by the Portuguese in 1830s and soon became a cash crop; the popular crop grown was robusta coffee (in its 2000 and odd plantations in Angola, owned mostly by the Portuguese). It was even one of the largest coffee producing country in Africa, in the 1970s. However, the civil war for independence from the Portuguese rule devastated the coffee plantations and many coffee agronomists migrated to Brazil and the plantations became wild bushes. However, the rehabilitation of the plantation has started since 2000 but the investment required to replace the 40 year old unproductive plants are estimated to be US$ 230 million. With opening up of new roads industrial activity in the province is taking shape. Some of the important monuments in the province are the tomb of Mekabango, and the tomb of king M’Bianda-N Gunga, ruler of the resistance movement. S. Jose church built in the 18th century is also located near Encope rock outcrop. A fort constructed in the 20th century is also located next to the church.